I finally got my awesome friend Andrew to start posting some of his pictures on flickr. He was taking some on the 4th of July. 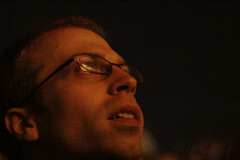 Here is one he shot of me watching the fireworks show. Just thought I’d like to share it.